Here's my card for this month's Viva la Verve sketch. I created a coffee themed design with a seasonal feel courtesy of the snowflake patterned paper used to cover most of the cardfront. I used a sentiment from Verve's Coffee Helps set on the card's focal panel. The text was stamped in brown pigment ink. 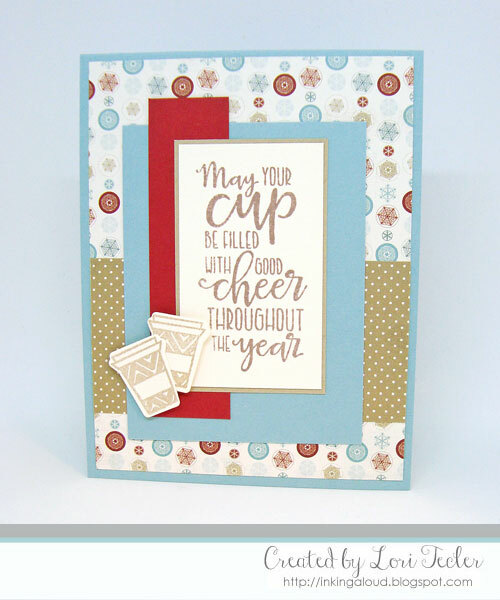 I accented the words with a pair of to go cups from the Holiday Treats stamp set, stamped in kraft ink and cut out with the matching Cup of Cheer dies. The rest of the panels were chosen to coordinate with the colors in the patterned paper. I mixed in a patterned paper scrap from the same paper collection as the snowflake paper to add interest. The finished panel was adhered to a coordinating blue card base. This is just darling, Lori! Love the papers you chose and of course the coffee! :) So glad you could join us for Viva la Verve!